If you have seen this video a hundred times, please don’t go away yet. If it is new to you, please take a moment to view it. It was produced in 2008. At the time, it was at the leading edge, and it was used as an introduction to so many presentations on school reform and educational technology. I encountered this video this past week in an interesting context. I won’t share the context right now, but I do want the share my reaction to the video as it relates to the question, “How do you lead change?”. This video is really old, yet so little has changed in the 4-5 years since it was first produced. Why is it that there has been so little change? Perhaps I think this way because of my current perspective. There are pockets of change, pockets that have reached that critical mass and are growing now. This was so evident at #ECOO12 last month, and #Unplugd12 earlier this year. When I moved to northwestern Ontario, I wanted change to happen fast. I created this wiki, hoping others would collaborate on it with me. I led professional development sessions on Web 2.0 tools. I think some people were interested, but not committed, and it fizzled. I failed. But from failure comes learning. Back then, my approach was “here I am, this is what I know, you should do this too”. I couldn’t understand why nobody else was excited about this. How do you lead change? How do you turn this frustration, this utter frustration, into leading change? For me, there was a strong need to flee. I felt so totally isolated in a place where nobody seemed to be “getting it” that I just wanted out. I was scared that I was getting behind just because my own learning felt like it was at a standstill. Fortunately, I can live in the beautiful, isolated place, yet still find my tribe. The movers and shakers in education are just a tweet away. By building and growing my online Professional Learning Network (PLN), I could still move my own learning forward while modeling the kind of learning and change I knew had to happen. When you are trying to lead change, finding your own peer group, your own learning network, your own support system is critical. Going it alone isn’t going to work. A leader needs to be able to thrive in the environment too. If a leader feels like their own growth is being stifled, the excitement, the learning, the conversations will not have the energy and enthusiasm needed for change to move forward. Leaders need to keep growing and modeling change, they can’t get stuck. Leaders need to celebrate all the little events that show progress. We need to build that critical mass where you have so many people sharing and learning together that collaborative learning becomes the norm, and those not doing it are the odd people out. Teachers have taught me this year that I have to meet them where they are. This is not about where I am, this is about where they are and what they need to move forward. It was a career highlight for me this week when I walked into the staffroom and heard a teacher say, “ Did you see that video that Donna posted on Twitter last night?”. Then, the teacher proceeded to show the video to her colleagues on her smart phone. Wow. That is what a staff room should look like, full of excitement about sharing and learning. Early one morning this week I woke up and checked my Twitter feed to find that another aspiring leader had joined our conversations on Twitter. 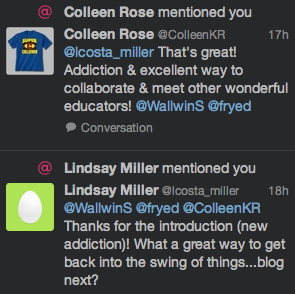 Within a day she was already writing about how “addicted” she was to the learning and how blogging was the next step for her. When another teacher asked about starting a wiki, I shared with her the wiki I started four years ago. We talked about how four years ago, this was the wrong approach. I didn’t recognize that it was too early, that change isn’t linear, that there are the right starting points for different people, and that where I was, was not where they were. Building capacity with teachers is critical if change is to happen. With social media, “giving the tools to teachers” has become much easier. Talking about tools and sharing resources and enthusiasm is not enough. Listening to teachers talk about their ideas for their students, and matching that enthusiasm with the right tools for them to move forward is essential. We must introduce educators to places where they can enhance their own learning and find others with the same needs and goals. We can all learn on Twitter 24/7. There are over 300 educational chats, and the amount of information on how to bring 21st century learning and skills into the classroom is overwhelming. Encouraging teachers to use technology, and to model their own learning, needs to be a priority if change is to occur. Change involves learning. It is an exciting time for learning for all, not just students. Learning to learn is critical for all of us to thrive as we move to make our schools better reflect where society is, and to focus on preparing our students for the world as it is today and as it will be for them, not the industrial model of the past. I appreciate the blog entry, and the fact that you are working to initiate change within our board. There are many opportunities for technology to be used effectively within our schools – I’ve started with some, (including a personal website, Twitter, online discussions, etc.) but for every attempt at what I think is making positive change I feel like I encounter multiple roadblocks. These roadblocks become frustrating to the point where I just end up contending myself with the status quo, which ends up shortchanging both me and my students. Sometimes as a teacher I don’t see eye-to-eye with administrative policies, (and we have had our own discussions where we have had varying perspectives on an issue, Donna! ), but it is refreshing that you are so willing to drive positive change and I commend you for it. Thank you @GeraldtonSteve, another pioneer here in the north. Thanks for being one of those sparks that keeps all of us moving forward. As you can see, we are building a bonfire! We want this badly enough and slowly, ever so slowly, the brick walls are being smashed, my friend. Our northern students will benefit from your persistence, as will the people they connect with. Stay with it. Beautiful reflection. It’s so hard to feel held back when you’re so excited about moving forward. New ideas and tools definitely ignite passion in education, and when you realize the potential for others, they sometimes need a bit more time to realize that too. It’s pretty cool to see that, although some might not appear interested, they might just be observing for a while — soaking it in to see how things work. Patience indeed. Ah yes, lurking. You will see many posts that describe lurking in a negative light, but I know I “lurked” in the shadows a long time before having the confidence to “joint the campfire” (see comment by @Stephen_Hurley). As educators we have experienced an evaluative environment for so long that it takes time to realize that your ideas are valued and sharing is critical, not just welcomed. In my early teaching days, we created things for our students and hid them so other teachers wouldn’t steal them. That competitive, evaluative environment is not conducive to student learning and not what we want to model for our kids, but it takes time to shake that. As we move toward the model of a community of learners, and a community on a global scale that ignores age and geography, we need support, but we also need to take risks and join the community as a giver, not just a taker. I am so pleased that you took the time to read and to comment, because this sharing is what moves us all forward. As Stephen Heppell says in the video, we are existing in this amazing, not-quite-synchronous learning space that gives us time to reflect, research and share. Thank you for helping me to create learning this morning. Thanks for the post and for the opportunity to respond. I remember the words of @thecleversheep (Rodd Lucier) during the opening session of the @unplugd11: “What are we gathered around?” This question has haunted me ever since because it reminds me that change has to do with more than individual passion and individual vision. It has to do with more than the strategies or tools that we think we (and everyone else) should be using. Rodd’s question points to the fact that, whatever it is, we are in this together and unless we are motivated by a shared and compelling vision of the future we want, we’re probably going to remain firmly entrenched in the present, or even in the past! I think that social media has represented a type of campfire for me over the past few years: a place to gather, dream and scheme. But, when push comes to shove, if we really want those dreamings and schemings to take root and grow, we’re going to have to find ways to take our message on the road. You’re doing that in so many ways, and so are a whole bunch of other people. But how do we build momentum and get things really moving? That’s what inspires me, and it sounds like you may be similarily inspired! Learning about leading change… how appropriately titled. I’ve been mulling this over a lot lately, and relate to many of the thoughtful reflections of others posted here. Check it out! It would be great to see this list grow with others’ suggestions. As we know, there is a lot to be learned from the world of business, from the history of humankind, from war, politcs, spirituality and media… hence the diversity of books selected. However, as diverse as this list apprears, there are some common threads. Effective Leadership requires fortitude and perseverance. Effective Leadership requires emotional connectivity and strong values. Effective Leadership requires resiliancy and patience. In a connected world, we are able to support one another as we lead educational change. We are able to provide the support that those within our walls cannot. We are motivated by the successes of others, and access a variety of platforms to share stories of the road. This posting came at a very crucial time for me in my attempt to lead change through practice within a classroom setting in Northern Ontario. Our schools are places where we have a small number of colleagues, each with varying experiences, biases, and preconceved notions on the value of technology in their classrooms. Many of these views are from a negative angle due to issues out of our control (such as time to learn and master programs, access, and serious bandwidth and connectivity issues). Our board has also struggled in recent years with trying to get teachers to use Promethean technology in a useful manner, a technology which is largely less useful than more user friendly software such as PowerPoint, SmartNotebook, and really any other programs. While the pressure to use the Activ software on the Promethean Boards seems to be waning, teachers have now been given a new tool to learn how to use in the D2L LMS environment. It is a complicated program that, truly, is going to take people a lot of time to figure out before using it. (I’m pretty tech saavy, and even I gave my local eLC a hard time about using it when I have far more user friendly and visually appealing programs outside of the D2L environment) While we select few who are interested in such things go to training and hear the message of “start small with one thing”, other teachers don’t necessarily hear that message and resist it because it is just another thing to add to their already busy workloads. The result in our small northern schools is that feeling of isolation that you mentioned in your posting. As a younger male teacher in the intermediate division, I find teachers around me are skeptical about using the tools I share with them enthusiastically because they feel I have more time, more energy, more familiarity with technology, and students that are old enough to learn how to use these tools. I often have to remind them that when I taught grade 4/5 in Marathon, my students were far more receptive and willing to use new tools than my grade 7/8’s are today. Unfortunately, that only addresses the latter of their remarks. I often wonder if they are right. Am I really only able to create a blended classroom enviornment where my students engage with each other and students from other schools online because of the time that I have invested iver the past 3 years to learn these tools? Is it really feasible for teachers with busy families at home to invest their precious time in such an endeavour? I don’t have the answers, but I have been overjoyed recently by truly connecting with other educators on Twitter, which was really brought about for me by the Learning 2030 project on TVO’s The Agenda with Steve Paikin. By connecting with others through #Learning2030, I have started to virtually meet many educators who are as enthusiastic about using technology to engage students as I am. Due to Twitter and blogs such as this, I have found a whole new repitoire of tools that I am implementing in my classroom on a weekly basis to augment what we already do in the classroom. While still isolated in my school and community as a tech-teacher, I can now collaborate with teachers in other areas of the province who have some fantastic ideas to mine.